Godzilla vs Destoroyah (1995) – SKREEONK! 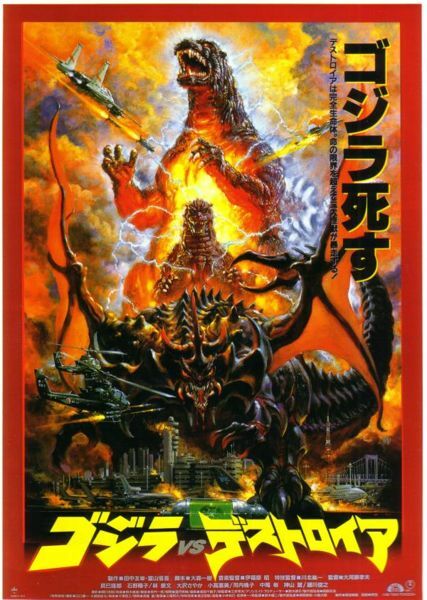 Godzilla vs Destroyah (Destoroyah, or ゴジラVSデストロイア Gojira tai Desutoroia in it’s native Japanese) has some of the most visually stunning posters in the franchise. In 1995, TOHO spared no expence when sending their famed reptilian patron into cinema history. 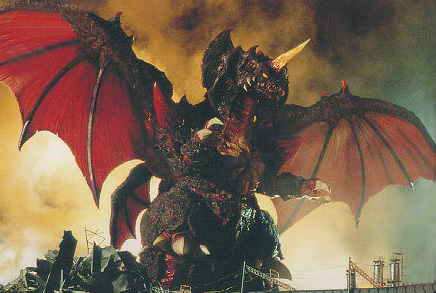 Godzilla vs Destroyah (or Destoroyah as I like to say) is one of the best Godzilla movies of all time on many levels. The monster action is superb, as are the special effects that make it possible. Akira Ifukube is also back, giving us one of his best scores yet – injecting emotion into Godzilla’s passing like no other human on Earth could even attempt. I sincerely enjoy this movie. To be honest, Godzilla movies can be just short of a guilty pleasure – simply because the old Showa flicks (and some of the newer ones) just aren’t meant to be taken seriously – but are still a ton of fun to watch. Godzilla vs Destoroyah, however, was properly made to be the exact opposite of that sentiment. This film was taken seriously by TOHO out of respect for its titular character, and in return – fans and non fans alike can also take this film very seriously. For that reason, and many others – GvsD is a hell of a ride. Such is the dilemma our human characters are faced with. Simultaneously, a brilliant scientist has invented what is essentially another Oxygen Destroyer… and the world is in havoc. 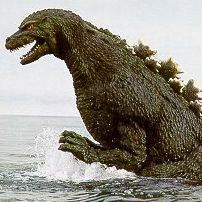 The movie itself is heavily connected with the original Godzilla film, GOJIRA (1954), and the plot ties itself directly in with the historical events that took place 40 years ago. The Oxygen Destroyer, created by famed scientist Dr. Kyohei Yamane, was used to kill the original Godzilla. Now, his two grandchildren have become an intrical part of the tale. His grandson, Kenichi Yamane – a college student, has developed startlingly accurate research on the nuclear and biological makeup of Godzilla, and has been hired by G-Force to aid in the prevention of armageddon. Kenichi’s sister, Yukari, is a top news reporter in Tokyo, and plays a key part in relations with Dr. Kensaku Ijuin, the creator of the modern Oxygen Destroyer. Dr. Ijuin has accidentally created life with ancient soil samples collected at the death-site of the original Godzilla. His micro-oxygen technology has combined with an ancient life form and escaped from a container, mutating in the seas and wreaking havoc on civilization. Yet despair turns into a miracle as it is discovered that the Oxygen Destroyer creatures may be the only way to stop Godzilla from melting down. Not only that, but Junior is discovered – alive and well, and has now mutated into a young adult Godzilla. Using her telepathic connection with Godzilla, famed Miki Saegusa uses Junior as bait – leading both reptilian behemoths into battle with a now massively mutated oxygen monster known as Destoroyah. The resulting battle will decide the fate of the world. G-Force has estimated that if Godzilla’s core temperature and energy can be reduced – then so can the resulting explosion of his demise. They plan to let Destoroyah sap the energy from Godzilla’s dying body, and use their own technology to freeze him simultaneously. G-Force sends in their newest aircraft, the Super-X-III, using sub zero lasers and cadmium missiles to freeze Godzilla as he melts down in an epic battle with the adult Destoroyah. In the midst of the chaos, Destoroyah slays Junior, sending Godzilla into an emotional rage. The resulting sequence is heartbreaking and breathtaking as Godzilla’s heart explodes, sending his body into meltdown. The Super-X-III freezes Godzilla as he implodes within his own nuclear energy. The resulting explosion desecrates Tokyo. But like a phoenix from the ashes… Junior rises once more – the energy from his father’s passing has mutated him into a full grown Godzilla – continuing the legacy of the King of the Monsters for years to come. 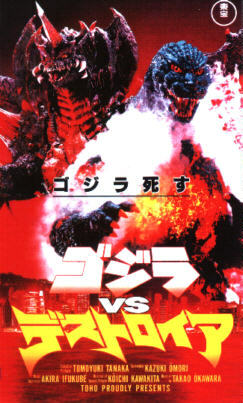 Godzilla vs Destroyah won several awards after its release in Japan. It not only won accolades for its box office receipts and critical acclaim – but also for its special effects work. 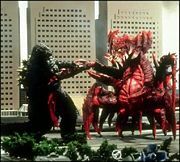 The monster sequences, particularly the human scale attacks by the Destoroyah Aggregates (junior forms of the devastating monster), are dazzling, and are executed with an excellent sense of both horror and suspense. And of course, the beautiful score by Akira Ifukube is nothing short of sensational throughout, and supplies the heart of the entire film. The incredible adult form of Destoroyah. This is by far one of TOHO’s best kaiju designs, and the suit is spectacular to behold on film. The plot really works for this film. GvsD is largely recognized as the death of the ‘original’ Godzilla in both spirit and cinema – and the idea to tie his last film directly with his first was an excellent one indeed. The film carries a heavy tone, one that warns humanity to learn from the mistakes of it’s past and not to repeat them. And in the end, all will pay for the mistakes of a few. It feels that way in reality as well, doesn’t it? Yet the technical part of this film that impressed me the most was the cinematography. Combined with the excellent directing of Takao Okawara, the camera work in GvsD is superb – giving us clear yet suspenseful depictions of everything from the monster battles to the death of Godzilla himself. As a whole, this film comes highly recommended to fans and non fans alike. Godzilla vs Destroyah is a rare five star entry into the franchise – and honestly the only Godzilla film outside of the original that deserves such praise. With believable acting,well executed plot, superb special effects, a heartwrenching classical score, and top-notch monster action – Godzilla vs Destroyah will no doubt go down as one of the all time best in monster entertainment. Godzilla Jr. and I give the film a nuclear-charged FIVE STARS! Godzilla vs. Destoroyah holds a special place in my heart. I’m not sure whether it’s the powerful score, the breathtaking Godzilla suit, the very organic-looking Junior, the wicked Destoroyah, or the beautiful end, but I love this film dearly. Unfortunately, I can’t say my fellow Goji fans share the same passion. However much I like it, I half to admit that it shares the slow pace and lost opportunity of the later Heisei films. Besides Godzilla’s death and a few bits of the King’s battle with Destoroyah, not a lot of scenes stand out or shine very brightly. The good bits are just great, but I can’t say the same for most of the movie. And although Godzilla’s ‘meltdown’ state is incredible to look at, I feel that it was underplayed. Looking at that steaming flesh and molten rashes, I can only imagine the pain Goji was going through. But this isn’t really addressed in the film. They could have shown the Monster King going insane with agony, and literally boil in rage, yet they failed to display much of either. But again, the climax is amazing. The sheer power of Godzilla as he blast Destoroyah in the last stages of his meltdown is very primal and savage, and the King melting into a puddle of radioactive goo is oddly beautiful and heartbreaking. I love that even the hardened military and government leaders who have been trying to off Goji for years look to be on the verge of tears. Very fitting, as I’m sure we fans felt the same way the first time we watched it. However many times Godzilla’s been beaten down and ripped up, nothing can quite compare to the meltdown. Even in his dying moments, the King seemed to defy his fate, letting loose one last roar as he dribbled into nothing. I’d also like to give a shout-out to Destoroyah and Junior. Destoroyah is a brutal villain, tossing around Godzilla like nothing and killing Junior without mercy. And Junior proves himself a proper successor to the title of King of the Monsters, taking on Destoroyah’s earlier forms in a way that would make his old man proud. And the score is great as well. Ifukube brings both his classic Godzilla tune, and a new main theme that’s just as awesome. The general consensus is “mediocre movie, great climax”, and I’d have to agree to that. For such an important part of the Godzilla legacy, this movie is a mixed bag. Still, couldn’t hurt to give it a watch and make up your own mind about it. Posted on August 31, 2011 0 By Jon D. B.	Kaiju Movie Reviews! Posted in Kaiju Movie Reviews!, Toho Movie Reviews!